Our first excursion after arriving in Adelaide was to Victor Harbor – about 80 km (~50 miles) south on the coast of the Fleurieu Peninsula – to dive at Rapid Bay Jetty. 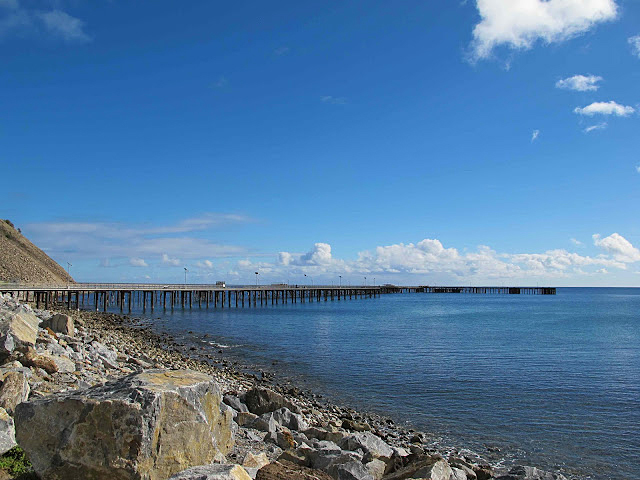 This site comprises an older, longer wooden jetty (now closed to the public) and a shorter jetty that was recently built following campaigning by the local diving and angling community (See http://www.rapidbayjetty.org). Why? Well for divers this is one the best places in the world to see the leafy seadragon (Phycodurus eques)! 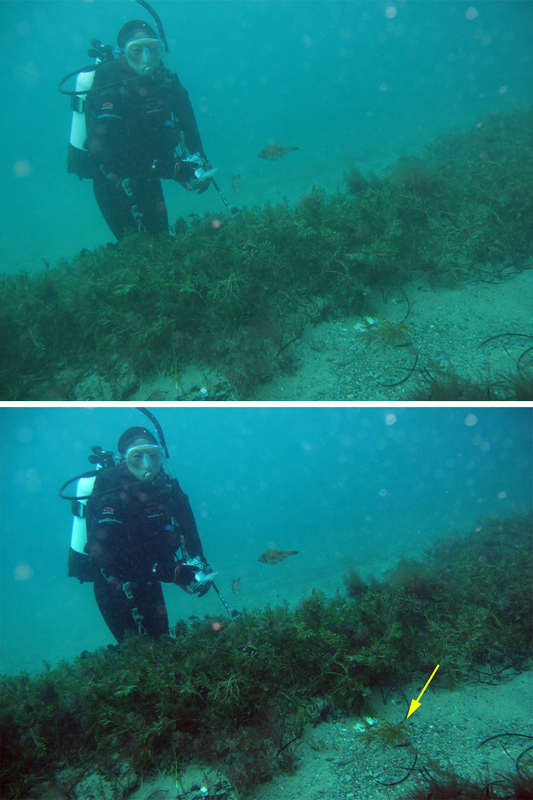 When we descended under the new jetty, we saw large areas of a seagrass (marine flowering plant) called Amphibolis antarctica as well as other seagrasses (Zostera spp.) and various brown and red algae. It was there, at a depth of about 15 feet, that I saw my first leafy seadragon! Leafy seadragon (Phycodurus eques) at Rapid Bay Jetty. Over two dives, I saw nearly a dozen of them. 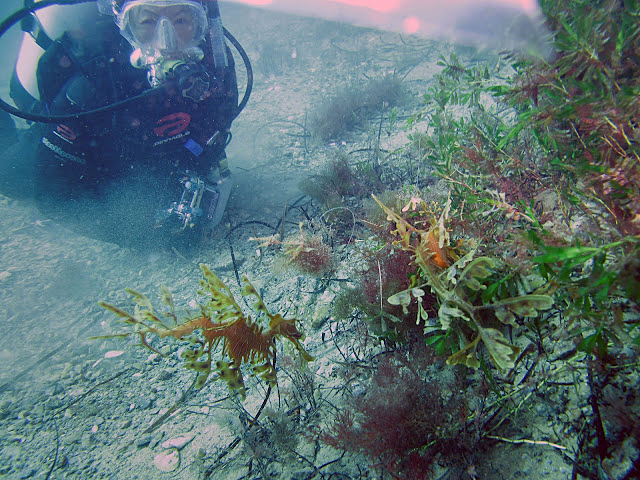 What an incredible site to see leafy seadragons in their natural South Australian habitat. 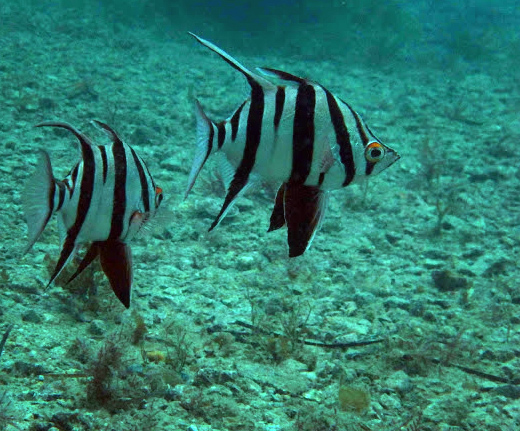 These fish are experts at camouflage, so they are difficult to find if you don’t know they’re there. 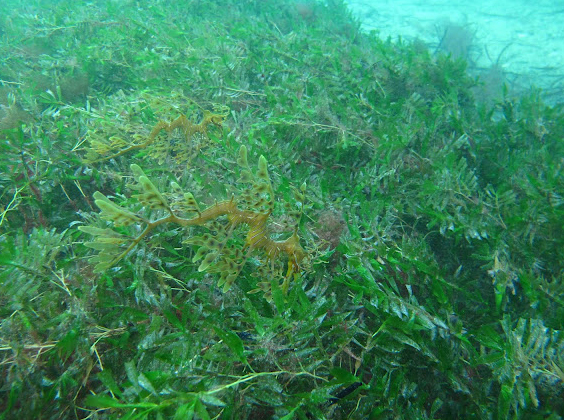 Art of Deception: Two leafy seadragons (Phycodurus eques) blending into the seagrass at Rapid Bay Jetty. 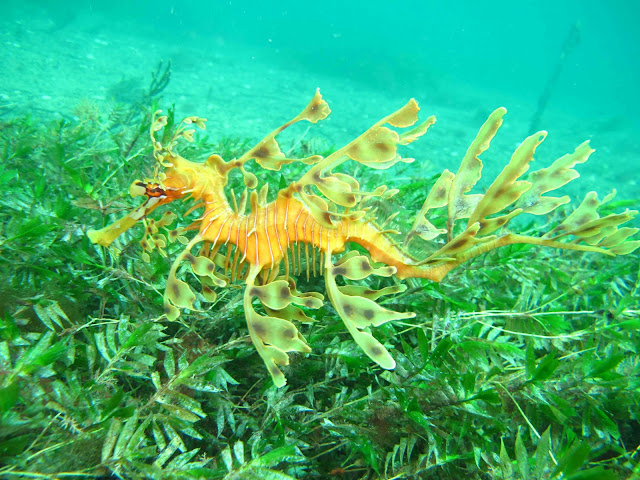 Camouflage Kings: Can you spot the leafy seadragon? The seadragons were so interesting to observe (check out the videos below). They drifted along edges of the seagrass and algae, poking their snouts inside as if looking for food. It was nice watch them up close; they didn’t seem to mind our presence. Me with two leafy seadragons. I’m pretty excited. 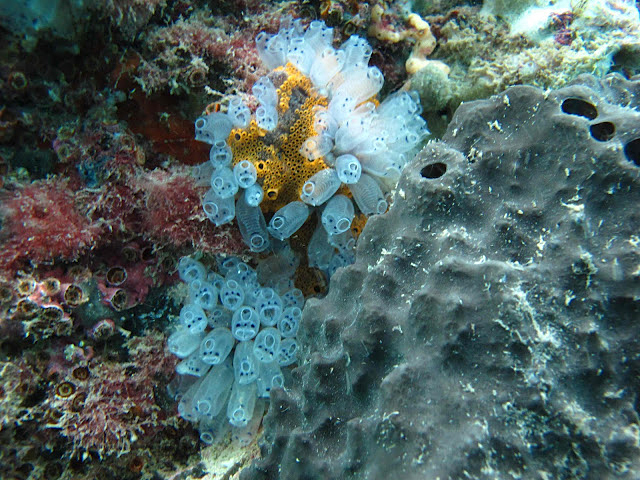 The lush pilons of the old jetty were also home to many other species, some that I’d never seen before. It was almost overwhelming but also exhilarating to see so much diversity. 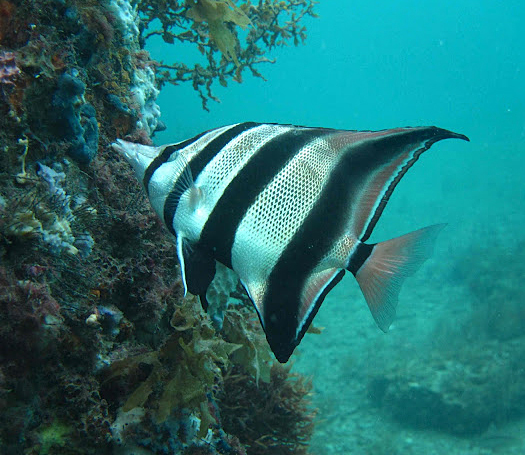 A leatherjacket at Rapid Bay Jetty. 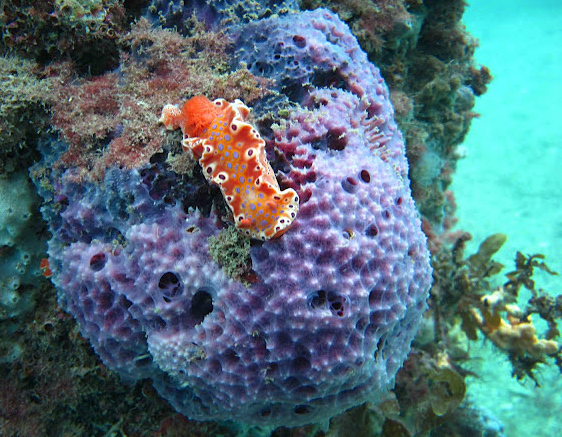 Beautiful nudibranch (Ceratosoma brevicaudatum) on sponge at Rapid Bay Jetty piling. 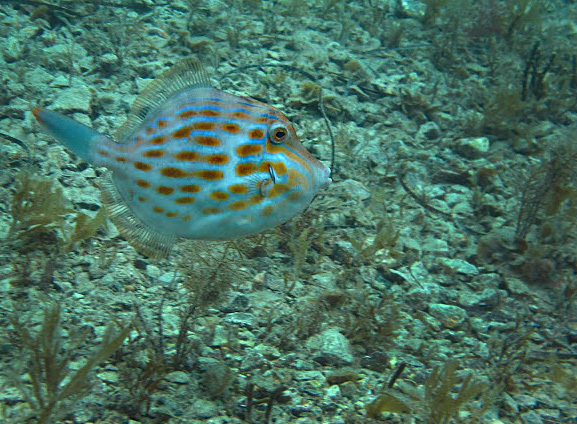 Old Wife (Enoplosus armatus) at Rapid Bay Jetty. Truncate coralfish (Chelmonops truncatus) near piling at Rapid Bay Jetty. These were the final dives of our research trip. They were beyond compare and a great way to end this amazing journey. 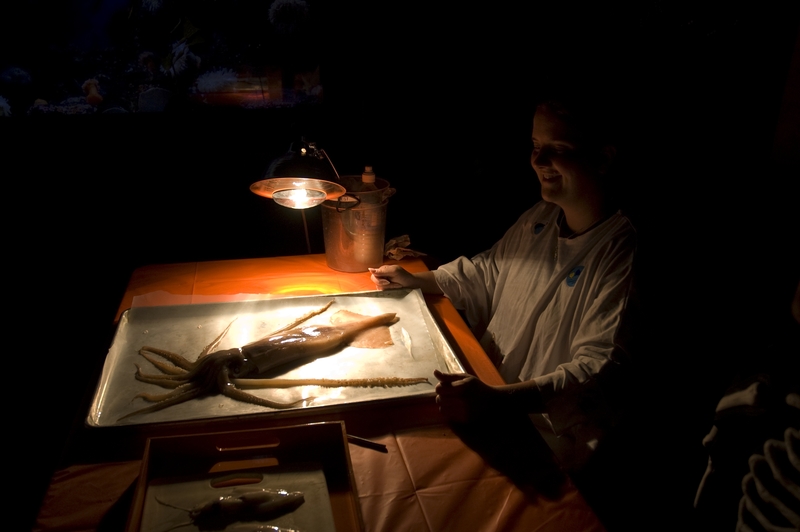 Scripps Institution of Oceanography professor Greg Rouse and I parted ways in Adelaide, but we’ll regroup back in San Diego to continue our efforts to breed seadragons at Birch Aquarium at Scripps. As for me, I couldn’t pass up the chance to see the Great Barrier Reef. I’m taking some personal time to dive in the world’s largest coral reef system. I can’t wait. 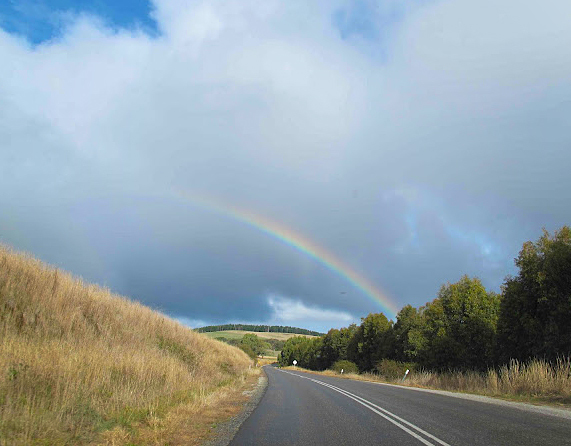 A beautiful rainbow leaving Rapid Bay to end our awesome day. It seems like you had an amazing adventure. I always like such type of adventures. All snaps and videos are also very nice. Thank you for showing such wonderful vision. Have fished from that jetty not knowing what an outstanding world is down below. Thank you for presenting South Australia in such a positive way.